The highlights of this road trip include the Hoh Rainforest, Olympic National Park and the Washington Coast. The Olympic Peninsula is where Sitka spruce and western hemlock reach heights of up to 300 feet. Enjoy lake life, hiking trails and views of the forest. This trip could be done in as little as three days or you could linger a little longer. If lush green, saturated temperate rainforests are what you are after then this is the road trip for you! This three day driving itinerary begins in Seattle and loops around the Olympic Peninsula of Washington and then finishes back up in Seattle. Of course you could always do this driving itinerary in reverse. Feel free to explore Seattle prior to your road trip or at the end. ​You can also extend your road trip to include some detours mentioned below such as taking a tour through North-Western Washington. MAP OF THE OLYMPIC PENINSULA DRIVING ITINERARY INCLUDING STOPS. This short road trip will allow you to see the Olympic Peninsula's highlights at quite a leisurely pace. You could potentially complete it in two days if you were after a weekend getaway idea but if anything we recommend tacking on an additional day to allow some extra time for camping or relaxing. If you were to extend your itinerary we suggest driving out to Neah Bay which is on the peninsula's most northerly point. See our sample itinerary below but obviously you can customize when and where you want to spend your time. We recommend getting a guide book for the Pacific-Northwest to make the most of your trip! Travel guides for us come in handy when that campsite you were hoping for is full and you need to find another nearby or to look up any notable hiking trails in the area. The best time to visit is subjective and dependent on your interests. May and early June is great for viewing waterfalls and the weather will be beginning to warm up. However the higher elevations will more than likely still be under snow and the beaches are still quite drizzly and foggy. Dry weather and sunny skies are usually between July and September but will coincide with more visitors to the area. The beaches can be very wild and windy in winter and Washington experiences endless days of drizzle and rain during this time of the year. Some places may not be open in winter too so check ahead. ​Once here you will be surrounded by serenity and the largest living specimens of Sitka Spruce, Western Hemlock and Western Red Cedar. Depending on your budget and preferences you can stay at one of the camp sites found along the lake or at the Lake Quinault Lodge; a rustic lodge built in 1926 also located on the lake's shore. ​We stayed at Wallaby Campground where each campsite was hidden amongst the lush rainforest with some of the sites having water views. All campsites had fire pits and a picnic table. Our little slice of paradise for the evening was surrounded by marrionberries which made our stay a delicious treat. We spent the evening beside the lake splashing around, fishing and eating fine cheese. The following morning we headed over to the Lake Quinault lodge to rent canoes and paddle around on the lake (you can also rent stand up paddleboards or row boats). ​The lodge was gorgeous and the sitting room had a lovely ambience. You are permitted to lounge around on their luxurious leather lounges and read a book, use the wifi or snuggle up by the fire place. There are also Adirondack chairs placed out on the lawn for basking in the sunshine. We were told the sweet potato pancakes were divine but did not have time for lunch. Try and allow yourself some time to complete the scenic 31 mile loop drive around the lake. There are many great viewing scenic and wildlife viewing opportunities. There are three campgrounds located along the south shore of Lake Quinault. Hotels in the immediate area are limited. See the below list for the only hotels here. Vacation homes are a great idea for staying in Quinault if camping is not your thing because hotels & motels are limited in the area. The options are quite grande (even though still a little limited) but it would certainly make for a truly memorable stay. Most of the vacation homes are lake front so are a perfect option if you are celebrating a special event or anniversary or just wanting to surprise that special someone. ​DIRECTIONS: Head towards the coast and make your way north to Ruby Beach on Highway 101. ​Ruby Beach is stunning and rugged like no other beach we have seen before. The energy here is wild and you will feel completely recharged after your visit. The beach is accessed via a 0.25 mile trail from the parking lot. At the end of the trail you will be greeted by large driftwood logs along the high tide line. ​Towards the north of the beach there are several sea stacks which are fun to explore at low tide. We stumbled upon the remains of a baby seal skeleton which was fascinating to inspect. An interesting historical fact about Ruby Beach is that it was the setting for two armed confrontations between the local Quinault Tribe and English and Spanish settlers in the late 1700's. There was so much blood shed here that the small island you can see from this beach was named Destruction Island. The campgrounds listed below are located south of Ruby Beach. The nearest lodging to Ruby Beach is Kalaloch Lodge. It's exterior is very rustic and quintessential pacific northwest. Otherwise your other options are in the town of Forks which is about 30 miles from Ruby Beach. There is quite a large selection of vacation homes available in Forks and in the surrounding area. The homes suit all budget types ranging from inexpensive tiny homes and a-frame cabins to large family style houses. DIRECTIONS: Head north again on highway 101 until you reach Upper Hoh Road on your right. If you are here in the summer time, keep your eye out (on your right hand side) on the way to the visitors center for a pull-over where you can view the Hoh River and stop for a swim by a small waterfall. The water is amazingly crystal clear and a magical green color. The water temperature is a little chilly bu invigorating! We had so much fun jumping off the rocks and floating around on our blow up pool bed. After cooling off, keep going until you reach the main area of the Hoh Rainforest. If you are spending the night at the campgrounds go and secure yourself a site becausethey are first come first served. ​One side of the campground seems a little less shady whilst the campsites at the other end have more cover and privacy. If you get here early enough you may even be able to score a site by the river. All sites have fire pits and picnic tables. ​When recalling memories of this place the terms surreal and other worldly come to mind. Mosses and ferns blanket the surfaces of the tree's and forest floor adding to the enchantment of the place. The Hoh Campground was a gorgeous campground and some of the sites are located right on the river front! It is important to note that the Hoh Campground does not take reservations and is only first come first served. If you would like the peace of mind of a reservation you can book Kalaloch and Sol Duc ahead of time. The closest lodging is in the town of Forks where you will find a range of accommodation styles such as hotels, motels, cabins and bed & breakfasts. DIRECTIONS: Getting back on Highway 101, head north past the town of Forks and make sure you turn right when you get to Sol Duc Springs Road. Take it all the way to the end. We only stopped at Sol Duc Springs Resort briefly. We had plans to soak in the hot springs but we were a little disappointed when we got there as we were expecting something with a little more of a natural setting. However don't let this stop you from having fun and if you have little ones they will love this place. We ended up buying drinks and lunch from the little store inside and having a picnic in front of the main building under the shade of the tree's. ​Sol Duc Springs Resort is in a great location and have cute little cabins for overnight stays that looked perfect for getting away from it all. ​We hiked out to see Sol Duc Waterfalls which is an easy loop hike from the resort. This waterfall fans into two waterfalls and crashes 50 feet into a narrow chasm. You can find the trail head at the end of the road the resort is on. The Sol Duc Springs Resot offers individual freestanding cabins under the tall evergreen tree's. Obviously you can use the mineral hot springs. There is also a small convenience store at the main lodge. The Sol Duc Hot Springs RV & Campground is located on the edge of Olympic National Park and has easy access to some popular hiking trails in the area. It is situated near the Sol Duc Resort which means the hot spring pools are only a short distance away. DIRECTIONS: Make you way back onto Highway 101 and head east. Crescent Lake is nestled in the northern foothills of the Olympic Mountains. This lake was a stunning azure blue and sparkled like brilliant diamonds in the sun the day we visited. Situated right on highway 101, every turn on our drive led to another gorgeous view. We pulled over countless times to take photo's. We did not however spend the night here as we were running out of time. ​There is a campground on the west end of Crescent Lake and there are many lake-side holiday cabins that we plan to come back and vacation in. There's only one campground around stunning Lake Crescent. If there is anywhere you want to rent a vacation home it is at Lake Crescent! The lake is crazy beautiful and getting a vacation home on the waterfront is just magical. We took a quick drive through the town of Port Angeles. It was nice to see all the old Victorian architecture which is mainly concentrated in the old downtown area and on the bluff overlooking the harbor. Port Angeles is known as the gateway city of Olympic National Park and is the jumping off point to reaching Hurricane Ridge. You can visit the Olympic National Park Visitor Center to get more information on the park. DETOUR: You can take the ferry from Port Angeles to Victoria on Vancouver Island, Canada for a day trip and explore Victoria or stay longer and explore the whole island. After visiting Hurricane Ridge make your way to Port Townsend for a quick visit before making your way back to Seattle. The Port Townsend downtown area is also filled with beautiful Victorian buildings. You can walk the waterfront and take in the gorgeous views of the Puget Sound and follow it up with a seafood lunch or dinner. If you're looking for an outdoor activity you could book a Dolphin & Whale Watching Tour. DETOUR: If you don't want to stop your road tripping adventure, you can catch the ferry from Port Townsend to Whidbey Island and take a road trip through North-Western Washington. Bed & Breakfasts are very popular in Port Angeles and Port Townsend and many of them are inside beautiful Victorian architecture homes. You can view the options available using the buttons below. ​DIRECTIONS: Continue to drive on highway 101 around the peninsula and eventually southbound until you reach Road 104. Follow this road until you reach the very end in Kingston. From Kingston you are able to drive onboard the Washington State Ferry service across to Edmonds. The ferry service runs quite regularly and is very reasonably priced (from memory around $17 per car). ​​DIRECTIONS: When you arrive in Edmonds you will once again be back in the world of traffic jams. Make your way back to the I-5 and southbound to Seattle, the final destination. If you did not spend time in Seattle before your road trip began, then make sure you set aside a day or two to explore this city. ​The Seattle waterfront has lovely views of the surrounding bay and offers plenty of seafood restaurants and cafes to choose from. The Pike Place Markets is worth checking out but can be very busy and the infamous gum wall is nearby. There are quite a few food options across from the Pike Place Markets that will tempt you for sure! 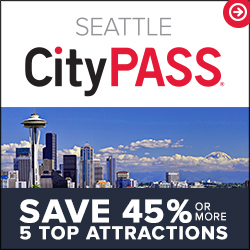 ​If you're interested in seeing all of Seattle's most popular attractions, you can purchase a Seattle City Pass for $89 which includes entry to the Seattle Aquarium, Space Needle, a cruise on the harbor, Woodland Park Zoo, Museum of Pop Culture, Pacific Science Center and the Glass Garden. If you would prefer a guided tour of Seattle we recommend this popular tour! Accommodation in Seattle is expensive!! Try to limit your time here unless you can afford it. Mid-range is so expensive you may as well stay in a high end hotel!! When my sister came to visit, the best we could find were apartments close to the university for $250 a night! You can always find a room on airbnb if you want to save money on hotel rooms. I just did a quick search and there were about 300 properties in Seattle. You can even find an entire apartment for about $90 a night! If you haven't used airbnb before you can get $40 off your first nights stay just for signing up.